That said, I love the creativity that blog-writers display, and the freedom they’re afforded allows for maximum innovation. So the journal process and the online process work side-by-side, allowing us to figure out best practices and maximize our efficacy as coaches, trainers, lifters, and athletes. 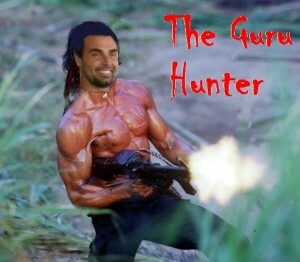 However, some online gurus take things too far (click HERE to figure out how gurus operate). They do this because there is no online checks-and-balances system…until now. I’m taking it upon myself to clean up the online strength & conditioning world, one guru at a time. I am a scientist at heart, and I know good and bad science when I see it. I’m putting this out there right now; if you’re an internet fitness expert and you’re a bully, if you promote pseudoscience, if your best ammo is logical fallacies, if you’re a jealous hater, if you’re an arrogant and cocky jerk, if you’re too much of a coward to name the person you’re talking about, if you simply make stuff up, if you talk about something with which you have no experience or expertise, if you cherry-pick research or data, if you can’t admit when you’re wrong, or if you simply make way too bold of statements based on what’s currently known, I’m coming after you. Just in case there are any folks who might think that I’m trying to show off in these posts or am just trying to gain popularity, this isn’t the case. I don’t think these posts will raise my popularity. People don’t like conflict and many will be turned off. This isn’t so much about popularity as it is standing up to bullies and promoting critical thinking and good science. Tomorrow I grill my first guru. The post Grill the Guru appeared first on Bret Contreras. The post Grill the Guru: Respectfully Calling Out Dr. Paulo Gentil appeared first on Bret Contreras. The post Challenging Naudi Aguilar of Functional Patterns to a Debate appeared first on Bret Contreras. The post How to Become a Functional Movement Guru in 40 Easy Steps appeared first on Bret Contreras.